United Cricket Club1st Division team. 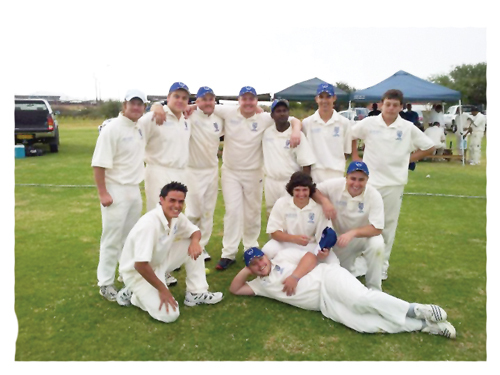 Back (left to right): John Valentin, Pieter Fouché, Eddie Viljoen, Shaun du Preez, Bhaskar Chuchukonda, André Maasz and Danie van Schoor. Front(left to right): Damon Coetzee, Hendrik van der Walt, Phillip Maass. Lying on the ground: Carl Maass. Yvonne Amukwaya of the Economist caught up with local aspiring Cricket Star, André Maasz on his hopes for the ever growing sport. Maasz who has been playing cricket for the past 12 years says that “Cricket is probably the only sport that is a close resemblance of real life; it humbles you when arrogance is clearly your biggest characteristic, and teaches you how to pick yourself up and dust off the disappointment, moving on with life because tomorrow is a new day.” Yvonne asked the questions and Andre gave his insights. What motivated you into starting to play? My motivation comes from Hansie Cronje who led the South African team of the middle-to-late 1990s to the highest point that I have seen any South African team reach since. In my opinion he is the greatest captain the game had ever seen. What has been your greatest achievement in cricket? I have had the opportunity to expand my bowling repertoire in using slower balls and exposing my skills as a swing bowler to the opposition. I would, however, also like to mention that I enjoy playing against Wanderers Cricket Club, I feel that they have a very good side which likes to win and thus they have a very determined mentality. It is also evident in the way that they have dominated domestic cricket over the last few seasons. So it is a feeling of great achievement when you beat a side like Wanderers. Which team do you play for and what position? I play for United Cricket Club. This season is going to be my second at the club. I enjoy the spirit at United, it is very informal which encourages you to just play for the love of the game. Although I do not only play one position, I’m mainly considered a bowler. Any major upcoming cricket games that you will take part in? Unfortunately I am in my final semester and because of the nature of my class hours, I will not be able to attend any practice sessions therefore I can’t be picked for the final 11. It is a hard thing to get over, as this season sees the start of the inaugural 1st Division Twenty-Twenty league. What are your hopes for your future in cricket? I would like to play for Namibia at international level one day, but firstly I need to put together one or two strong seasons that will “force” people to take note of my abilities with both bat and ball. Improvement is something that will always be on my agenda and I think that for now my hopes are to show that I’m worthy of recognition and that I can, with time, be good enough to face tough opposition all over the world. Which teams have you played for in previous years? I have played for three clubs since I joined the domestic scene. My first club has since been disbanded, but was known as Oshakati Cricket Club. The second club was Khomas Strikers. And now I am at United. What is your greatest challenge as a cricket player? The lack of high quality practice facilities is definitely a challenge. As a national sport we do not really receive large sums of money to upgrade and improve our structures. Another challenge is definitely the lack of competitive domestic cricket for all individuals. Perhaps even the fact that we are limited in cricket grounds in Namibia is also a major challenge because the pitches we play on do not really, or truthfully, reflect what you would see at grounds around the world. In short we cannot really build and improve ourselves without the proper facilities, technologies, or high level coaches with strong principles and morals to forge a great team.